Percy Hunter : July Skiing in Australia, 1911. Volume 1, Number 1, January 1911, pages 11-15. Although the article is essentially a tourist promotion for Australian ski resorts, in comparing the sport with surfboard riding, Hunter provides significant information on Australian surfing. Notably "we now have a board or two at Manly beach" (page 12). It is highly probable that these boards were those ridden by Tommy Walker and his relatives at Manly, circa 1909. 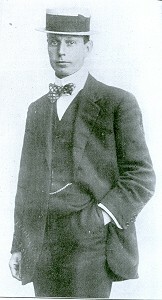 The current Director N.S.W. Govenment Tourist Bureau and an enthusiastic skier, he indicates a knowledge surfboard riding acquired when visiting Hawaii as a tourist sometime before 1911. 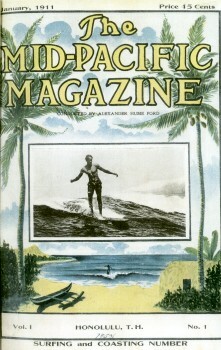 Clearly he was not the only Australian visitor to be exposed to the thrills of Hawaiian surfboard riding. For a contemporary profile of Percy Hunter, see below. "as the surfrider balances on a single board or runner, while coming down the side of Kosciusko we balance on a pair of runners or skis" (page 11). The report is one of the few independent sources not directly from the surf life saving movement. This article kindly provided by Craig Baird (Surfworld, Torquay) in August 2009, who noted it "came to me via Dr. Garry Osmond (University of Queensland) after I had forwarded a Surfers Journal Article about Alexander Hume Ford (that) mentioned Percy Hunter's articles." I have enjoyed the Glorious American Fourth riding down the white-capped billows at Waikiki on the elusive surfboard; in July, in Australia, we ride down the great snowy billows of Mt. Kosciusko. and the sensation is the same. The Hawaiian surfboard is about the length of the ski, only it is five times as wide; as the surfrider balances on a single board or runner, while coming down the side of Kosciusko we balance on a pair of runners or skis. The ski, which has come to us from Scandinavia, is a long plank of mountain ash, from 3 1/2 to 4 1/2 inches wide, and from 7 feet 6 inches to 9 feet in length, about an inch thick at its stoutest part, the center, tapering to about half an inch at either end. It is upturned in front, in order to glide over inequalities in the snow, or small obstacles. The foot fits through a broad leather strap laced across the middle of the ski or shoe, the heel being left free. Skill in the pastime is not difficult to acquire. It is claimed for ski running that it is the highest advantage that any physical exercise can safely derive from terrestrial at traction, and the practised snow-shoer who has tried other sports will readily admit this. Free wheeling down a mountain on a bolting bicycle is exciting, motoring at a hundred miles an hour along a level road has its own peculiar sensations, ballooning is by no means tame, and riding on the front of a flying express locomotive makes the wind roar in your ears, and puts a tingle in your blood. I have tried them all; but, without hesitation, I place ski-running over a snow bank that drops away at the rate of a foot in two and a half far before the best of them. I will give a description of skiing uphill, for this may be valuable to the Hawaiian, although he will never be able to surf up a wave. In the old days, I was told in Hawaii, the natives used to ski down the smooth, grassy mountain sides, and there is one mountain peak in Hawaii, Mauna Loa, 14,000 feet high, where real skiing might be possible. It is probable, however, that you will have to come to Australia to learn your skiing, as we must go to Hawaii to learn to ride the surfboard, although we now have a board or two at Manly beach. There are two great thrills in the world- surfboard riding and skiing down the snow caps of Kosciusko. In Australia, our summer (sic, should be our winter) is at its height in July; America's summer vacation time. The Government Tourist Bureaus of the several Australian Colonies invite the Americans to leave their torrid summer behind and enjoy our July snows. Try the Hawaiian surf- board, as I have done, and then experience life's other great thrill - Australian skiing. Unaccredited: Pacific Personalities - Percy Hunter of Australia. Volume 2, Number 1, July 1911, pages 88 and 89. Page 89 A COMING AUSTRALIAN OF NOTE. Percy Hunter, slated for Under Secretary of New South Wales, now active Vice-President of the Hands-around-the-Pacific Club, has made the art of "Tempting the Tourist" not only a study but a business. they made the world sit up and take notice of New Zealand. Hunter, (he scorns the Mr. among friends), is more proud of the fact that he is a man of the people and helped to organize the labor party in Australia than he is of the accident of shakIng hands and chatting with King Edward. men typical of chances in America. Born in Ballyrat (sic, Ballarat), as was the Australian prime minister, Dekin (sic, Deakin), Hunter started out to eam his living at the age of eleven. He wanted to be a printer and moved to Melbourne and called the city of Melba his home until the Sydney Daily Telegraph tempted him northward. From early boyhood young Hunter was known as the "live wire" in any enterprise or venture in which he embarked. Sir Joseph Carruthers, Prime Minister (sic, Premier) of New South Wales, kept an eye on the brlght young reporter and when Australia decided to follow New Zealand's lead and establish a Government Tourist Bureau, young Hunter was appointed to organize and carry the work to completIon. Hunter proved the right man in the right place. So important became his department that the finest office building in Sydney, Challis House, was erected as its home. Everywhere new government hotels, government roads, and resorts came into being. Not only the tourist, but the people of New South Wales caught the fever and became ardent travelers about their own country. 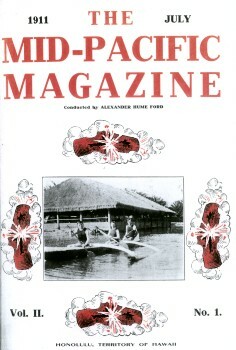 Four years ago Percy Hunter and the editor of the Mid-Pacific Magazine met in Sydney, and together outlined the Pan-Pacific campaign now being carried on. At the Pan-Pacific Congress in Honolulu Percy Hunter and Lorrin A. Thurston made, drew up and proposed the motions that were adopted by that body. Hunter is today seeking to tempt the native-born American to settle in Australia. It is probable that his government will send him to the North-west to tell the American farmers that Australia has adopted the American irrigation system with the result that millions of acres in New South Wales, once considered desert, are proving to be the finest wheat and orchard land in the world. When Hunter returned to Australia from the Pan-Pacific Congress held in Honolulu, it was to report to his government that Australia's opportunity had come in the sanction by Congress of San Francisco as the City of the Panama Exposition. At that exposition Australia will make the greatest display she has ever sent abroad. Like the average Australian, Percy Hunter is lanky, but with all the fire, energy and assurance of the American youth just out of college; but with it all a prepossession that convinces. When Hunter talks Australia, everything else is forgotten; he remembers only the importance of being in earnest. It is to be hoped that America will have an opportunity of studying at short range this young man, who revolutionized for an entire continent the method of handling the stranger within the gates. Geoff Cater (2007) : Percy Hunter : July Skiing in Australia, 1911.